As I wrote a while ago, I was going to reveal the identity of the prey in my architectu ral hunt and I have finally gotten around to it. If you want cooler picture from artsy people I suggest searching on Flikr or google images because not only was I working with my little digi cam, I was doing so under the influence of a Brazilian waxing which does not lend itself to movement or creative thinking. 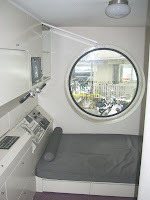 Anyhoo the Nakagin Capsule Tower (中銀カプセルタワー） was designed by Kisho Kurokawa and completed in 1972. Located in Shinbashi near Ginza, it is not a capsule hotel but an apartment building consisting of stacks of 2.3m x 3.8m x 2.1m capsules. People still live there today but the courts passed down a final decision last year and the structure is slated for demolition (when I'm not sure). What's worse is poor Mr. Kurokawa died last year asking that his building not be torn down. The tower is located along a main street with a highway overhead, making it a bit difficult to get a good look at it and limiting most photos to a worm's eye view. It's clear it has fallen into disrepair and is in need of a good wash, but it is still very cool. Looking at it again further reinforced my wish to be one of the pod people living up in their concrete tree houses. The tower reminded me of the kind of place Wes Anderson would use in one of his movies. Probably because of the ship/airplane-like 70s interior of each capsule box and the eccentricity of the building as a whole and probably those who live there. Here is a picture of the interior. start until one floor up. Due to the core structure of the tower, each capsule is a detachable single unit but I doubt they plan to do anything of the sort and will probably just come in with a wrecking ball. If you like kooky architecture or want to imagine life as one of the pod people, check this cool tower out before it comes down. As one reader beat me to the punch in pointing out, there is even a blog out there written by someone on the inside! It's in Japanese but if you're interested check-check-check-check it out.